Anxiety is a feeling of worry or unease, sometimes about a future event or sometimes for a reason that you don’t quite know. Anxiety symptoms include a sudden feeling of panic, heart palpitations, a sensation that you’re going to pass out, trouble breathing, hot flashes or chills, even trembling. We offer natural anxiety treatment here in our Toronto clinic. Anxiety vs stress. While stress is generally caused by something external going on in your life right right now, anxiety is more future-focused and not always the result of an external challenge. Naturopathic vs conventional treatments. While a psychiatrist will prescribe anxiety medicine, a naturopath will prescribe herbs, supplements, lifestyle counselling, dietary counselling and acupuncture. Talk therapy is often warranted as well. Manifestations of anxiety. There are plenty of ways that anxiety can be exhibited such as phobias, panic attacks, panic disorder, etc. Any of these may affect the quality of life if it interferes in work or at home. Anxiety disorders. Certain disorders such as post-traumatic stress disorder is most likely attributed to trauma. However, research has shown that there are other factors that may cause anxiety. This includes hormonal issues, thyroid conditions, diet. Stress can be healthy. Some stress – called eustress – is helpful to keep you motivated to get things done. Symptoms of anxiety. Some people experience generalized anxiety, which often has no readily apparent cause. They can be going about their business and then the next thing they know, they’re getting heart palpitations, shortness of breath, feeling of Jell-o wobbliness in their legs and this sense of weird energy flowing through their arms, their palms sweat. De-sensitization. Is a process where a therapist will get you into a state of calm and then mentally take you to a situation that gives you anxiety, and help you learn how to cope with it in your mind. Then from there, you can start to go out and experience the situation yourself, starting small and overcoming that and then gradually getting bigger and bigger. Phil: I think it’ll be great to start talking about the difference between stress and anxiety so people understand that. Chris: It’s basically … I mean, anxiety is sort of a mental health condition if you want whereas stress is a factor that you could be experiencing like stress and that can worsen your anxiety if you’re predisposed to it, that sort of a thing. It’s almost like stress … You can think of stress as the fuel but they’re quite different because there’s no necessary connection between stress and anxiety. Phil: Seems to me that stress is something that’s happening now based on something that’s going on in your life and can be perhaps relieved more quickly if you can learn how to deal with that, whereas anxiety might not be due to specific cause, is that often the case? With anxiety you’re feeling anxious but it’s not always there’s a stressor in your life. Chris: No, no, that could be true too, and also what I thought you were going to say which would also would have been true was that anxiety is very future focused. There can be something in the present that is potentially a trigger for your stress, but the feeling of anxiety is usually based on some… often ill-defined concept of what may happen. Phil: Okay. You’re a naturopathic doctor focusing almost exclusively on anxiety and anxiety disorders, what are people … When they come to you, what are they feeling? Other than anxiety, why are they coming to you? How do you describe it? Chris: Often it’s at two ends of the medical care spectrum. Sometimes people come before … They want to try something natural before they are… before pharmaceuticals. There’s that end of it. On the other side of it is people who are either on pharmaceuticals and it’s just not enough, and they want something that’s not … They want something that’s not going to interact or is unlikely to interact with what they’re currently taking that their psychiatrist, for example, put them on. Or they are in the process of weaning off the drugs that they were on and they, again, they just want a little bit of help in that process to make it as smooth as possible. It’s usually kind of at both ends. Phil: Can we talk about those as 2 separate cases? Phil: Even though I’m sure there’s almost like a spectrum. What if we just started with a general feeling of anxiety, what can people expect when they talk to you, how do you help them? Chris: Well, we spend a lot of time talking about the nature of their anxiety. What we’re really looking for is to get enough of an idea about their feelings of anxiety that we can recommend treatments that are simple and effective. I think the more you understand what’s causing it, the easier it is to recommend good treatments rather than just recommending the same thing to everybody across the board. We take time in that first appointment to do that, so that’s generally the process. I mean, there’s enough variation between individuals that I can’t really give you like, everybody will have this happen other than to say, there’s that first visit where we talked quite a bit and try to make some good recommendation. Chris: Well, there’s similarities, let’s start with that. The similarities would be I do often recommend that people try to find a therapist that’s a good fit for them. We do some talk therapy type stuff here, but again, depending on the person, quite often, seeing a therapist regularly is a good idea. What’s different from say, a psychiatrist, it’s simply that I would not recommend pharmaceuticals. Not to say that I don’t recommend anybody be on pharmaceuticals of course… to place, just that I being a naturopathic doctor, I’m recommending other things. Often herbs, supplements, certainly but really because we as naturopaths do lifestyle counseling, in the dietary counseling, acupuncture, to give another example of something that I do possibly less that herb and supplements, but those are all things that maybe brought to bear if the situation wants it. Phil: Sounds like it really is tailored to meet persons needs, you also are counseling on dietary changes, exercise, things like those? Chris: Yeah, if it’s wanted, there are times when people come in and they’re already doing everything quite well in terms of their diet, for example, but sometimes not. What a shame to miss something as simple, not necessarily easy, but as simple as dietary or a simple lifestyle tweak that could impact your mood. Phil: It’s the kind of thing where I think we can all think of things we can do ourselves if we’re experiencing anxiety to relieve it, but a natural plan can really help you figure things out that you can’t figure it on your own. Chris: Sometimes it helps to see somebody who’s seeing things a few times that can offer note side perspective, for sure. 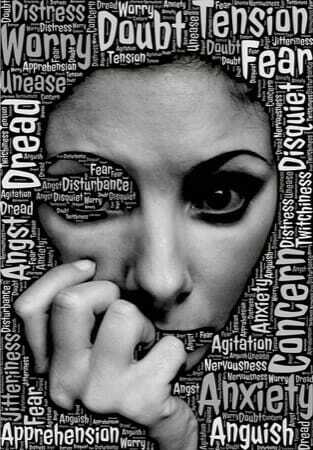 Phil: On to some more serious anxiety disorders. Phil: I don’t even know … Maybe you could lead me where we should talk about that. Chris: Sure. Well, I mean… there’s a wide variety of manifestations of anxiety. You could typically … I don’t see many people who come complaining of phobias, for example, so that’s not a… that’s not a common thing. And in any case, I don’t know that I would have any strong recommendations for that, frankly, other than to go see a therapist. The… probably the most common one is generalized anxiety disorder, that people come in with, if they have a diagnosis. Some just … You know often, they worry quite a bit would be one of the defining features on that one. But panic attacks are quite a common reason for people to come as well, and/or panic disorder. And the… and sometimes, what can… what goes along with panic disorder, is agoraphobia, which would be … Well, for many people, in manifests in not wanting to, you know, leave the certain safe zone, not wanting to be without certain safety people, for example, or even safety objects. And so that can quite severely impact quality of life, right? Because you can… some people are no longer comfortable going to work, or can’t… can’t work because they aren’t comfortable leaving the house, and so on. Or even going out of their neighborhood. So… so that can be … that I mean, of course, people have a hard time coming to see me in the clinic at that point, but we can certainly arrange house calls and stuff like that as well, should the need arise. There’s… I mean, there’s a number of other anxiety disorders. Obsessive compulsive disorder would be another one that people get sort of talk about a lot. Phil: For these anxiety disorders, panic and OCD, are they generally because of a trauma, or are they… can they be caused by a nutritional issue, a hormonal issue? Are they sort of naturopathic? Chris: Yeah, yeah. So certainly like PTSD, post-traumatic stress disorder, would… would almost by definition, require a trauma. But things like panic, not necessarily. You know, people will have experienced panic attacks. I mean, it’s not uncommon at all for people to experience panic attacks. The reaction to that panic attack is almost what predicates, you know, the… how much it affects you psychologically after. If you have an intense fear of panic attacks, or if you register certain bodily sensations as highly problematic, you are more likely to have a negative evaluation of it, and then so, it becomes more of a problem. So I wouldn’t say any trauma per se, but there’s a lot of research on sort of what are the… what is the basis of anxiety, and what are the biological and sort of early life experiences that bring about anxiety? And there’s… there’s a ton of factors, and it’s hard to generalize as to what would be the issue. Can hormonal things worsen anxiety? Absolutely. Can thyroid conditions worsen anxiety? Totally. Can… can dietary things influence anxiety? Absolutely. And that’s not … I mean, we typically don’t leave those stones unturned here, but sometimes, it’s not your thyroid. You know, sometimes it’s not your adrenal gland. Sometimes it’s not, per se, I mean as the root cause. Excuse me. Sometimes it’s uhm… sometimes it’s just the way you think about the world, you know, which is one of the reasons why I do regularly recommend therapy, because I think that’s a valuable addition. Phil: Let’s start talking about the difference between stress and anxiety. Does it even make sense to start there? Phil: Is that something that you think about? Jeff: Well, I think it’s almost, if I were to create the distinction, it’s sort of more along the lines of sort of like, stress is something that, for starters, stress can be healthy. Stress… a certain amount of stress is necessary to get you up and motivate you to go to work so that you can make a paycheck and keep your boss happy so that you don’t lose your job and you can feed your family. That’s called eustress, and it’s positive stress. It gets you up and it gets you going, and it keeps you motivated. But then there is… then there’s stress that starts to overwhelm and, it’s typically related to when eustress becomes too much, in a way. It’s almost like, how would I put it, you’ve got one, two, three deadlines coming up and they’re … they’re all on the same day, and you’ve got to get three things turned in and you have three days left and let’s just say you had been working diligently but there’s still so much to do, and once you start to feel overwhelmed that you lose the ability to actually sort of keep yourself going and keep yourself able to keep on task. You get so focused on the stress itself that it takes over, that’s when it becomes unhealthy stress, and that’s when it’s important to take a step back. I can just remember times when I was talking with housemates, back when I was getting my degree, and just a person was just sort of like, “I got this to do at one o’clock and I got this to do at four o’clock, and then I’ve got to get this turned in and it’s related to co-op and it’s got to be turned in first thing on Monday. And oh, my God, I don’t know what to do. I feel so lost. I can’t do any of it.” And that’s too much stress. That’s going beyond eustress, and at that point, it’s really about, “Okay. Stop.” And ask yourself, “What time is it now? What do I need to do now in order to take care of Thing One and what do I need to do now to make sure that Thing Two is going to be done on time, as well, after Thing One is done? And, sometimes it takes a little bit of… sometimes it takes someone to coach you through that. If you have been stewing in it for so long, it becomes so overwhelming you can’t think your way out of it. Jeff: It’s… anxiety can be tied to stress, but anxiety has many different causes. Some people experience generalized anxiety, and that means they start to develop panic symptoms and… but there’s no attributable cause. It just happens and for whatever reason, they can be going about their business and then next thing they know, they’re getting heart palpitations, shortness of breath, feeling of Jell-o wobbliness in their legs and this sense of weird… of almost like weird energy flowing through their arms, their palms sweat. All of it, and… but there’s no reason whatsoever. It’s just happening, and it can’t be attributed to anything. And I do want to point out that although, you know, this is a description of symptomology, you would always need a psychiatrist to be able to make a diagnosis of any anxiety disorder. But going back to what I was saying, there does not seem to be a cause, it’s just happening. That’s general. Then, there can be something very situation-specific like a fear of crossing bridges, or a fear of heights, and that’s typically called a phobia. Whereas, you don’t tend to experience anxiety except in the situation where you are that frightens you so much, and then you might start to get the symptoms, let’s just say, in your… I used to have height fear, so I would, when I found myself in a very high place, suddenly, I would almost feel like I was falling, when I saw how high up I was. And on top of that, I’d get the heart pounding and panic symptoms. Often, what was… what’s required to help get you out of that is to use something called “de-sensitization”, and de-sensitization is a process done in counselling or psychotherapy session where, for starters, you take the person to a relaxing, sort of relax them and sort of get them to close their eyes and go to a relaxing place, a place where they feel comfortable, and then, once they feel good and relaxed, with their permission, in their minds, take them to a situation where they experience that particular fear and get them to slowly but surely experience. For this, my example, experience the sense of being up high and try to stay with that sensation of anxiety until it starts to calm down. And also, what could be… what’s often recommended is to have the person actually go out, and when they’re not in session and try to expose themselves to that frightening situation and, you know, be willing to… Okay, if you’re afraid of heights and it’s more than anything higher than four storeys, let’s say, or three storeys … let’s say it’s three storeys, you start by trying to go up four storeys and then look out this… look out a window or go out on a balcony, see how high you are if… and once you feel comfortable with that, you increase it to five or six and you just slowly increase up the ante, so to speak, until a person feels comfortable being fairly high up. Officially, now, you’ve been able to step out onto that clear glass played at the CN Tower, for a moment or two, but still, you know.